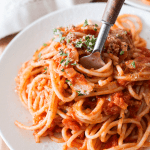 Vegan Tomato Cream Sauce and Pasta is a staple recipe to have in your house on those nights when you need dinner on the table in 15 minutes and you haven’t had a chance to venture to the grocery store yet. Creamy, delicious and nutritious, this is the perfect meal for big and little ones alike. It also packs well for lunch the next day. It can be so easy to get caught up in trying to create something new and interesting, that you can forget that sometimes it’s the simple meals that are the most enjoyable. Take this week for example. We had some mushroom cold rolls with chili and lime dipping sauce, some chicken and zucchini skewers with salsa verde, and a lovely Summer Stone Fruit and Spinach Strawberry Pecan Salad. All really yummy, and well received by everyone in the house. But kinda fancy for everyday weeknight faire. Tonight….I just couldn’t come up with anything exciting. Life gets busy and sometimes coming up with the mental energy to create something new just isn’t going to happen. 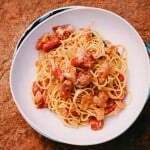 That’s when you need something quick and easy like a classic creamy tomato pasta sauce and some spaghetti that can be thrown together quickly, and you know everyone will eat. My kids’ favorite thing to do is sprinkle cheese on their pasta, so I knew if they were going to eat their dinner there had to be something to sprinkle on top. On a whim, I grated some cashews and they were thrilled with the results. It looked exactly like parmesan cheese but also added a depth of flavor to the pasta dish which was just lovely! 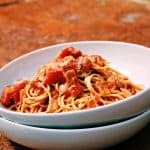 What Ingredients Are Required For Vegan Tomato Cream Sauce? One that everyone has probably thrown together at some time in their life. And it is made out of ingredients most people no doubt have lingering in the fridge and pantry. 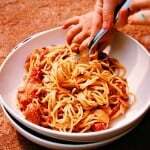 Is Vegan Tomato Cream Sauce and Pasta Kid Friendly? Definitely. What kid doesn’t like spaghetti? Mine didn’t even miss the cheese and were actually quite intrigued with sprinkling cashews on top. They thought it was a bit of a treat. Do you have a favorite staple dish you fall back to on those days you just can’t muster the energy for something different? I would love to hear what it is! Be sure to leave a comment and let us know all about it. A staple to have in your house on those nights when you need dinner on the table in 20 minutes. Creamy and delicious and perfect for big and little ones alike. Packs well for lunch the next day. Do you think it could be made with soy milk? GREAT post!! We really enjoyed. We found it on the sweet side with the cooked shallots, almond milk, and lovely roasted tomatoes (like little bites of candy!). We added zucchini and mushrooms to leftovers to balance it out. It may just be us because I see people loved as is. Have no idea if our version is helpful to others. Thanks so much for great recipe! Thanks for the post. Oh I love your version! It sounds delicious, thanks so much for sharing. I cant remember it being too sweet, will have to make it again soon to check (but that may have been why the kids like it so much!) 🙂 I guess it will depend a lot on the tomatoes used as well. I agree, the pic with your baby is funny- cute. I made this last weekend with tomatoes from my Mom’s garden. I used more then called for but I like sauce. It was really really good. Gonna make it again! Thanks! Yum! Oh I am so glad you enjoyed Soleah 🙂 And how lucky to have home grown tomatoes!! Sounds delicious! I love the idea of this simple, dairy-free meal. Your kids are too cute! 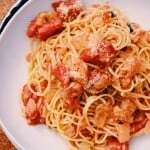 My son would love this recipe, he loves spaghetti very much! It always seems to be popular with the kids hey! I’m relating to the day you described. When the family is hungry; pictures are on the fly. This sauce looks really good. i’m not vegan, but I could definitely enjoy a plate of this delicious meal! Oh we are not vegan either Diane, we just eat vegan a couple nights a week 🙂 I am glad someone else can relate!! I looooooove spaghetti. Yours looks so great and I love seeing your kids eating it – your baby is adorable! This is the first time I’ve heard of avocado oil.. Do you buy them at specialty stores? There’s always little hands in my photos – I seriously spend half my time trying to crop them out 🙂 No, I just get avocado oil at the normal grocery store – it’s a high heat oil, so I use it in everything going on the stove top these days! Looks so good! Maybe I’ll make some for dinner tonight! Enjoy it if you do Bonnie!! Mmmm you are so right! 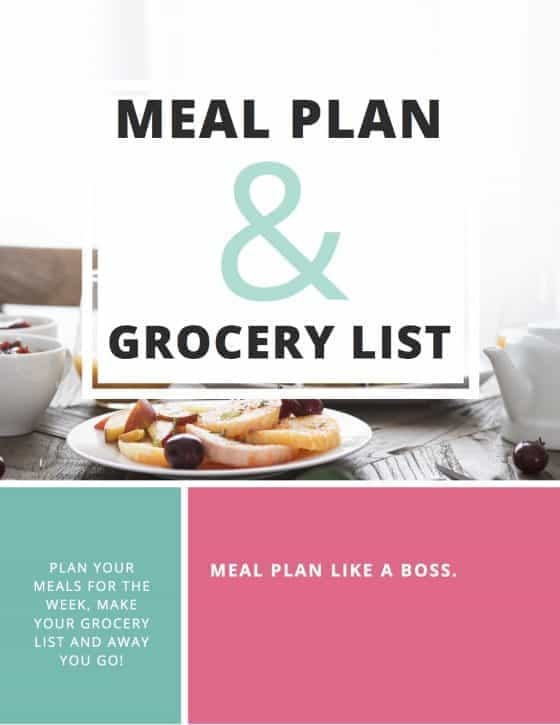 As a food blogger, I find myself just trying to make the most unique and diverse recipes for the blog, and I often forget about the classic recipes that everyone usually makes and eats at home! I’d love to try your spaghetti! That looks good and your kids seem happy with it. My go to meal is pasta as well. My kids were ecstatic with it 🙂 Pasta is just so easy hey! I love that this has a creamy tomato sauce, there’s nothing quite like a simple pasta dish. Looks like your kiddos enjoyed it too! The most simple and easiest recipes are often the best! 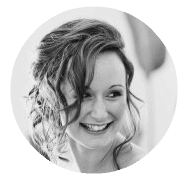 I know exactly how you feel about sometimes feeling that as a blogger you always have to bring something new, exciting, elaborate. But hey, we are all just humans and who really has time to make something elaborate all the time?! Wow, it’s amazing how easy it is to prepare awesome vegan dishes once you get the hang of it! The kids really didn’t seem to miss any meat or cheese, amazing!!! Well this is a super simple one to add to your rotation 🙂 I hope you enjoy! This looks delicious! Obviously that adorable little baby of yours is loving it! I have never made a vegan style cream sauce . Looks good! And I love there real -life photos! This looks delicious and the baby agrees! So adorable! Thanks Cristy 🙂 I think he is pretty cute! Yum! Pasta is my weakness, and this looks like a recipe the whole family would love. Thanks for sharing! I can imagine how good it is! I love vegan recipes! Never cooked with cashew milk before! Gotta try it! I laughed out loud when I saw the photo of your little ones all covered in sauce 🙂 That brings back memories….though my 12 yo son would probably still love to eat that way if we let him. I will have to try this recipe and hope that my kids will inhale it as well as yours did. Oh goodness, this tomato cream sauce sounds wonderful! Thanks so much for sharing Donna, I have lots of other pasta sauce recipes, but not one of these yet, can’t wait to try! Pinning! Thanks Justine! I hope you enjoy if you give it a go 🙂 I have a huge rotation of pasta sauces too!! Thanks for popping over Andele 🙂 I couldn’t resist throwing in the messy baby! Looks delicious!!!!! I have to try this! Looks so good! Those kiddies seem to be enjoying it too! Pasta is my love language- this looks delish! Thanks Bieke 🙂 She is too smart for her own good!